Ever Been Hit By an Iceberg? In a previous part of my career I spent a lot of time trying to understand icebergs and their behavior (is that what they consider anthropomorphism?). A lot of years have gone by since then but I am still curious about these massive pieces of ice. So I had to post this picture of a massive Antarctic iceberg colliding about to collide with the Mertz Glacier Ice Tongue. Even more impressive is that NASA captured a time sequence of satellite images showing the collision and fracture that calved a new iceberg. 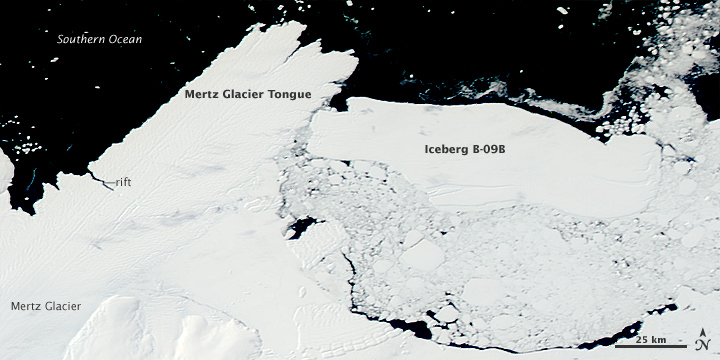 The first iceberg B-09B is approximately the size of Rhode Island and the new iceberg is estimated to have a mass of 700-800 billion tons! Talk about a major collision. Satellite imagery has a wide range of applications – not the least of which is their use in monitoring massive events like this in remote parts of the world.